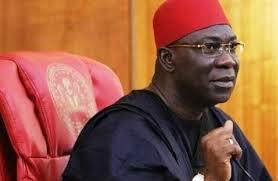 The Deputy President of the Senate, Senator Ike Ekweremadu, has congratulated the Governor of Ekiti State, Ayo Fayose, on his emergence as the new Chairman of the Peoples Democratic Party, PDP, Governors Forum. Ekweremadu, who described the Forum as an important group within the party, expressed confidence in the ability of Fayose to rally the governors elected on the platform of the party, teeming PDP faithful, and supporters to hold the fort in opposition. A statement signed by the Special Adviser (Media) to the Deputy President of the Senate, Uche Anichukwu quoted him as saying: “Governor Fayose is a strong voice in the opposition. He is an unapologetic PDP faithful and has the audacity, political sagacity, and benefit of experience from his number of years as a Governor to provide quality leadership for the Forum. I, therefore, nurse no doubts that he is the right man for the job. While commending the out-gone Chairman of the Forum, Governor Olusegun Mimiko of Ondo State for his meritorious service to the party and his State, the Deputy President of the Senate urged the PDP faithful to remain strong and hopeful as the party would bounce back stronger and soon to lead the nation out of the current stinging economic hardship. He said that having tasted two different puddings, Nigerians now know that despite PDP’s shortcomings and mistakes, which he said the party had also learnt from, it remains the only party with pan-Nigerian outlook, tolerance, liberal orientation, experience, and national appeal to manage the country. He enjoined Governor Fayose and the PDP Governors Forum to revive PDP’s trademark grassroots mobilization to assure the people that the party would emerge stronger to “restore economic prosperity, democratic rights, and sanctity of the ballot box”.